Military commandos shot dead passenger who tried to hijack Dubai-bound flight after threatening to blow up the plane. A Bangladeshi man who was shot dead after he tried to hijack a plane had been carrying a toy gun and did not have any explosives on him, police said on Monday. The passenger had tried to enter the cockpit of a state-run Biman Bangladesh Airlines flight after waving a gun and threatening to blow up the plane, airline and aviation authority officials said. “The pistol with the suspect was a toy pistol and he had no bomb attached to his body,” Kusum Dewan, additional commissioner of police in the southeastern city of Chittagong told Reuters news agency. “He appeared to be mentally imbalanced. We heard he had a personal issue with his wife and demanded to speak to the prime minister. But we are still investigating. We don’t want to come to any conclusion right now,” said the commissioner. Bangladeshi forces stormed a passenger jet in the country's southeast on Sunday and shot dead an armed man who attempted to hijack the Dubai-bound flight.Police later said the man was actually carrying a toy gun. The flight left the capital Dhaka at 4:35pm, heading for Dubai. 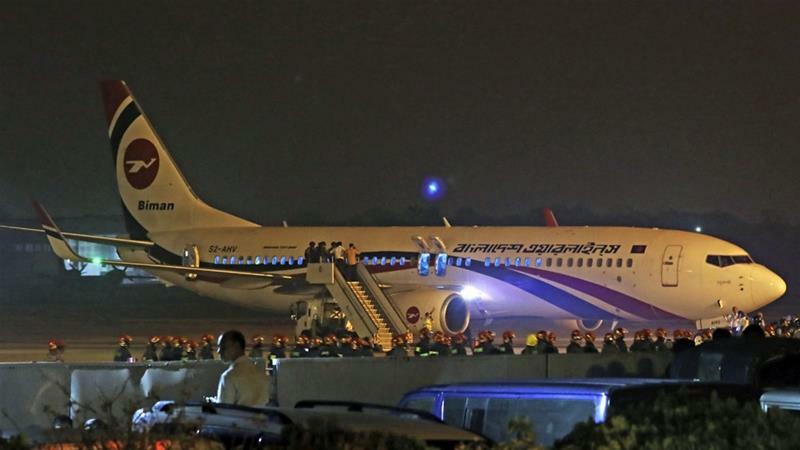 About 40 minutes after taking off, the pilot made an emergency landing in Chittagong after a crew member reported “suspicious behaviour” by the man, said Rezaul Karim, an official with the Bangladeshi military’s inter-service public affairs office. Commandos fired at the suspect after he pretended to shoot at them with the fake pistol when asked to surrender, army Major General Motiur Rahman told reporters, according to ATN TV news. He said that the suspect was carrying a pistol, but did not say where the shooting took place. The passenger, identified by the name “Mahadi” and described by officials as a 25-year-old Bangladeshi man, died from his injuries sustained after the commandos stormed the plane before reaching the hospital. All 143 passengers and seven crew members on board the Boeing 737-800 were safely evacuated.